I had to wonder why Little Man was crying, too. I also have never known him to bite, so I figured there would be a back story. Turns out she was trying to feed him a marshmallow when he accidentally bit her. I looked at her finger to find a small scratch. Then she turned her finger over, and I saw what looked like a big flap of skin hanging loose. I quickly ran to my bedroom and got the hydrogen peroxide and a band aid. When I came back to doctor her, I told her to hold her finger out. That flap of skin seemed to be gone. “Where is the skin that was hanging off?” I asked, perplexed. This weekend, I bit off a bit more than this Gimpy Momma can or should chew. I signed up to take the kidlets to an overnight camp with the preschool Little Miss attended last year. I know, a bit strange, but the venue is AMAZING. 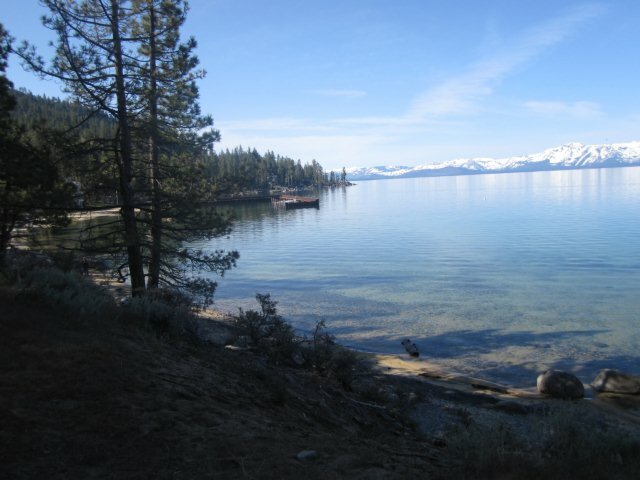 We went last year, and staying in a facility on the beach in South Lake Tahoe is divine, plus it is enclosed, has multiple play areas for the kids, and it is attended by a bunch of parents that watch out for eachother’s kids. What I didn’t factor into the equation was me being pretty gimpy still, and trying to manage a toddler in this space. Trying to make sure he didn’t kill himself while stumbling around and trying not to tear my ACL graft was a bit nerve wracking. What kept replaying in my mind was that my physical therapist had warned me my graft is weakest right now. He also said he had a patient tear his ACL graft in sand. So what was I doing? I lot of walking on sand with a lot of rocks, trying to carry 30 pounds of wriggling toddler, lecturing myself in my head that this was NOT a good idea. And then there were the sleeping arrangements. The kids and I ended up getting placed in the same room as a family of 4. I had arranged to bunk up with this family, but we all thought we were getting separate rooms. Not so. The other family was a husband and wife with two kids, a girl of 5 and a boy of 2. Have you ever tried to sleep 4 kids ages 5 and 2 in one room? No fun. Add to that the other two year old woke up almost every hour on the hour, in turn waking up the other 3 kids. None of us got much sleep. Our wake-up call came at 5:30am, when we woke to the cries of “Daddy, monster under bed! Daddy, monster under bed!” I didn’t move, assuming it was the other 2 year old. But no, the other mom in the room said that child was sleeping in bed with his Dad, who confirmed it wasn’t him crying. It was Little Man. My child of few words… That speaks mainly in grunts and pointing, and never says more than one word at a time. That child is the one who woke us all at an unGodly hour speaking a complete sentence! And of course, the sun was coming up, so all four of the kids were up for good. I quickly got up and dressed my kids, shuttling them out the door and to the dining hall, where I knew I could keep them contained and fed until breakfast (a long 2 hours away). Plus, I knew there was coffee there. Sounds miserable, right? Why on earth would I do this to myself? Because even when you’re waking up at 5:30am, seeing this first thing in the morning is simply breath-taking. Plus, the food there is amazing as well. All locally grown, organic, freshly prepared, I ate like a queen. And all of it was worth the misery (mostly) after I got to spend three peaceful hours on the beach with my kidlets on Sunday morning. 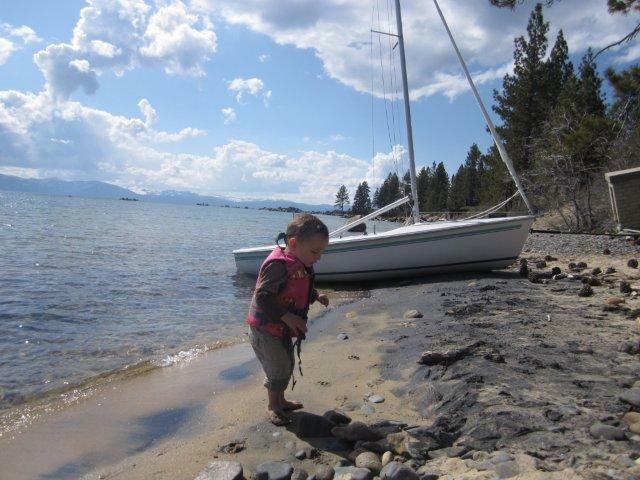 The water was smooth as glass, Little Man generously stayed close to me making it his mission to throw all of the rocks on the beach into the water, and I got to sit back and enjoy this amazing lake. 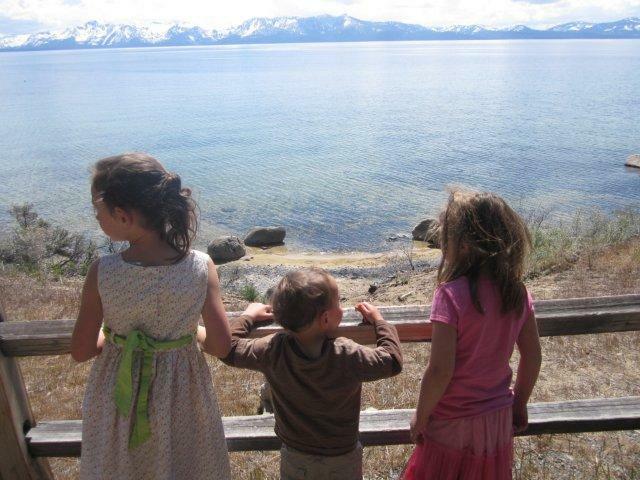 My kids are so lucky to be growing up close to Tahoe. I didn’t see this magnificent lake until I was 21. We left camp after lunch (oh, what a lunch it was!). The kids promptly fell asleep in the car, and when I got home, I transferred them to their beds, where they slept another 3 hours. I caught up on sleep, and once everyone got the sand and dirt washed off of them, we were pretty well recovered from our miserable night of sleep. My life lately has felt a bit like a practical joke being played on me by someone upstairs if you know what I mean. Momentarily underestimating the extent of my gimpiness, I enthusiastically agreed, excited for the kids to bike (Little Man on his brand new push tryke). Of course the weather here is screwed up, feeling much like the dead of winter if you don’t take into account that it stays light later and the plants are getting green. So, we all bundled up in our jackets, got the kiddos on their bikes, I got our geriatric lab, Shadow on the leash and we were ready. We hadn’t gone 200 yards when it became apparant that this gimpy Momma was going to seriously impede the progress of this outing. “How far can you go?” JB asked. I had no idea. I had thoughts of maybe today is the day I finally walk around the block again! He picked a street to go up with a large hill. I didn’t think Little Miss was capable of biking up that hill, but she was doing great. Until the asthma kicked in, that is. I ended up pushing her while she hacked up a lung, and limping way far behind JB and Little Man. At the top of the hill, we decided to take a shortcut home, which on a bum leg, even a shortcut feels like a long haul. Little Miss coasted downhill on her bike while I discovered that walking downhill on my bad knee is much harder than walking uphill. I limped along slowly. Little Miss waited for me, and her hands were freezing. Because I just didn’t think to put gloves on her in MAY. Minutes later, it started to pour rain. Oh, lovely. I felt like looking for hidden cameras. There I was, limping along, with a girl who is asthmatic and coughing in the cold, and as much as I wanted to rush home, there is no rushing when you’re gimpy. This morning, the comedy of errors continued, when we were gathering her dance shoes and tights for her VERY FIRST DANCE RECITAL EVER tonight. She got ballet shoes for her birthday in February, and I’ve been tripping over these things, and constantly picking them up as she left them strewn all over the house for the past three months. Now, this morning, when I’m running late for work, the darn shoes were NOWHERE TO BE FOUND. I finally dug them out, and in between giving her all of her different nebulizers, antibiotics, allergy medicine, breakfast, etc., I was super late to work… But I couldn’t leave until I did her hair in a “high, tight bun”. Oh, Lordy. It is a chaotic life I lead. I wouldn’t trade those kids for anything in the world… But some days I sure wish I didn’t have to contribute to bringing home the bacon. 5 weeks down, too many left to go to count… Progress is slowly happening. Today I measured at 135 degrees flexion, and my extension is good. I’m getting some new exercises, and my limp is decreasing a bit. I honestly thought I’d be a lot further along at this point than I am. I can’t walk far right now, and I’m very slow. I was looking at a chart displaye at PT today, and it shows that the ACL graft is weakest from weeks 6-12. My PT agreed, saying this is the most likely time that people tear their graft. I WILL NOT TEAR MY GRAFT. No way in hell I’m going through this again! The outdoor pool at my gym opened this week. Today at lunch, I felt obligated to be inside the gym doing my physical therapy exercises, but I couldn’t resist the draw of the pool. I managed to swim a mile, dragging my dead fish of a leg behind me, and instead of doing flip turns, I pivoted at the wall and pushed off with one leg. I’m strictly not allowed to kick, as it could stretch out my new ligament grafts. It was the most normal I have felt since the surgery. Plus, it was a highlight of my day to be outside in the glorious Spring weather under the sun and smelling the fresh air. I didn’t do my physical therapy exercises today, but swimming was good for my soul. It’s a working mother’s predicament of being between a rock and a hard place. I thought Little Miss was well enough to return to school, but I wasn’t sure. I sent her there yesterday, and worried about her all morning. She cried for the next hour. When I got her home, I gave her some medicine, got some food in her, and then wrapped her in a blanket and cuddled with her on the couch. She was out about 10 minutes later, at 6pm. I tried to wake her for dinner. She was OUT. She slept all through us making dinner, through us eating dinner, and then cleaning up the mess. I put her brother down, and then tried to rouse her again, thinking she should eat and get a nebulizer treatment, but there was no waking this princess. Finally, at 9pm, JB cradled her in his arms and carried her up the stairs to bed. I kept expecting her to wake up and ask for food, but she didn’t wake up until 12 hours later. So, my assessment is that a whole day at school is a bit much for her right now. She is thrilled that I said today she could “be a morning kid”, and I’d take her home for a nap in the afternoon. Her coughing has subsided, but my motherly intuition is telling me her body is going to need some extra rest for a few days. Little Miss has been getting me up almost each night this week, mainly due to coughing fits. Who needs a newborn when your five year old can yank you out of sleep by hacking up a lung?! The medicine is working, and her coughing is subsiding. Therefore, I was surprised to awake to her screaming in a panic at 2am. My knee is really stiff after I’ve been sleeping, so JB bounded up the steps as I limped my way up. The whole way, I’m chanting please don’t let there be puke. Please don’t let there be puke. JB promptly turned around and went back to bed. I crawled into bed with her, and asked her what happened in her dream. Really?! My first reaction was, wow, that would be one strong toddler to carry me down the stairs. But then I sat there perplexed, wondering why that dream would evoke such panic-stricken cries. I also thanked my lucky stars that her nightmares are so mundane. There are many children on this earth that have had horrible things happen to them and have truly horrific nightmares as a result. May all of her problems be solved so easily.